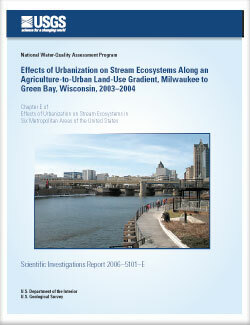 In 2003 and 2004, 30 streams near Milwaukee and Green Bay, Wisconsin, were part of a national study by the U.S. Geological Survey to assess urbanization effects on physical, chemical, and biological characteristics along an agriculture-to-urban land-use gradient. A geographic information system was used to characterize natural landscape features that define the environmental setting and the degree of urbanization within each stream watershed. A combination of land cover, socioeconomic, and infrastructure variables were integrated into a multi-metric urban intensity index, scaled from 0 to 100, and assigned to each stream site to identify a gradient of urbanization within relatively homogeneous environmental settings. The 35 variables used to develop the final urban intensity index characterized the degree of urbanization and included road infrastructure (road area and road traffic index), 100-meter riparian land cover (percentage of impervious surface, shrubland, and agriculture), watershed land cover (percentage of impervious surface, developed/urban land, shrubland, and agriculture), and 26 socioeconomic variables (U.S. Census Bureau, 2001). Characteristics examined as part of this study included: habitat, hydrology, stream temperature, water chemistry (chloride, sulfate, nutrients, dissolved and particulate organic and inorganic carbon, pesticides, and suspended sediment), benthic algae, benthic invertebrates, and fish. Semipermeable membrane devices (SPMDs) were used to assess the potential for bioconcentration of hydrophobic organic contaminants (specifically polycyclic aromatic hydrocarbons, polychlorinated biphenyls, and organochlorine and pyrethroid insecticides) in biological membranes, such as the gills of fish. Physical habitat measurements reflective of channel enlargement, including bankfull channel size and bank erosion, increased with increasing urbanization within the watershed. In this study, percentage of riffles and streambed substrate size were more strongly related to local geologic setting, slope, watershed topography, and river-engineering practices than to urbanization. Historical local river-engineering features such as channelization, bank stabilization, and grade controls may have confounded relations among habitat characteristics and urbanization. A number of hydrologic-condition metrics (including flashiness and duration of high flow during pre- or post-ice periods) showed strong relations to the urban intensity index. Hydrologic-condition metrics cannot be used alone to predict habitat or geomorphic change. Chloride and SPMD measures of potential toxicity and polycyclic aromatic hydrocarbon concentrations showed the strongest positive correlations to urbanization including increases in road infrastructure, percentage of impervious surface in the watershed, urban land cover, and land-distribution related to urban land cover. This suggests that automobiles and the infrastructure required to support automobiles are a significant source of these compounds in this study area. Chloride in spring and summer showed a significant positive correlation with the urban intensity index; concentrations increased with increasing road infrastructure, urban land cover, and a number of landscape variables related to urbanization. Spring concentrations of sulfate, prometon, and diazinon correlated to fewer urban characteristics than chloride, including increases in road infrastructure, percentage of impervious surface, and urban land cover. Changes in biological communities correlated to the urban intensity index or individual urban-associated variables. Decreased percentages of pollution-sensitive diatoms and diatoms requiring high dissolved-oxygen saturation correlated to increases in the percentage of developed urban land, total impervious surface, stream flashiness, population density, road-area density, and decreases in the percentage of wetland in the watershed. Invertebrate taxa richness and Coleoptera taxa richness decreased with increasing population density, developed urban land, impervious surface, and road length in the watershed, and invertebrate abundance decreased with increasing summer chloride concentrations. Decreases in fish IBI scores, total number of fish taxa, and number of native fish taxa correlated to increasing values of the urban intensity index, medium and high-intensity developed urban land in the watershed or 100-m riparian zone, total impervious surface, stream flashiness, and chloride. In multivariate analyses with biological assemblages, total impervious surface in the watershed was used as a representative for urban landscape variables, chloride, and road-infrastructure variables because of the high degree of correlation among these characteristics. The most important environmental characteristics defining algal assemblages were primarily the percentage of woody wetlands in the watershed, spring nitrate and summer bicarbonate and total phosphorus concentrations, percentage of runs, and total impervious surface. The most important environmental characteristics for invertebrates were stream discharge in the spring and when the discharge exceeded 50 percent of the time as normalized by drainage area, total impervious surface, and the hydrologic-condition metric Richards-Baker flashiness index. Environmental characteristics defining fish assemblages were primarily total impervious surface and several environmental characteristics not necessarily related to urbanization: spring herbicide detections, percentage of pools, watershed slope, maximum instantaneous peak flow normalized by drainage area, summer dissolved oxygen, stream-bank vegetative cover, and summer pesticide toxicity-index values for cladocerans. The fish Index of Biotic Integrity was a reliable indicator of fish assemblage relations to urbanization when metric correlations and results of multivariate analyses were compared. Results from this study emphasize the importance of assessing multiple indicators of urbanization—geomorphology, land use/land cover, hydrology, and chemistry—to understand potential effects on aquatic biota in urbanizing streams. Richards, K.D., Scudder, B.C., Fitzpatrick, F.A., Steuer, J.J., Bell, A.H., Peppler, M.C., Stewart, J.S., and Harris, M.A., 2010, Effects of urbanization on stream ecosystems along an agriculture-to-urban land-use gradient, Milwaukee to Green Bay, Wisconsin, 2003–2004: U.S. Geological Survey Scientific Investigations Report 2006–5101–E, 210 p.